New paper suggests that CO2 '…could prove to be our salvation from the next ice age' | Watts Up With That? From the University of Gothenburg , another head exploder for Joe Romm and company. Carbon dioxide – our salvation from a future ice age? Mankind’s emissions of fossil carbon and the resulting increase in temperature could prove to be our salvation from the next ice age. According to new research from the University of Gothenburg, Sweden, the current increase in the extent of peatland is having the opposite effect. “We are probably entering a new ice age right now. However, we’re not noticing it due to the effects of carbon dioxide”, says researcher Professor Lars Franzén. Looking back over the past three million years, the earth has experienced at least 30 periods of ice age, known as ice age pulses. The periods in between are called interglacials. The researchers believe that the Little Ice Age of the 16th to 18th centuries may have been halted as a result of human activity. Increased felling of woodlands and growing areas of agricultural land, combined with the early stages of industrialisation, resulted in increased emissions of carbon dioxide which probably slowed down, or even reversed, the cooling trend. “It is certainly possible that mankind’s various activities contributed towards extending our ice age interval by keeping carbon dioxide levels high enough,” explains Lars Franzén, Professor of Physical Geography at the University of Gothenburg. Peatlands act as carbon sinks, meaning that they absorb carbon dioxide from the atmosphere. They are a dynamic landscape element and currently cover around four percent of the earth’s land area. Most peatlands are found in temperate areas north and south of the 45th parallel. Around 16 percent of Sweden is covered by peatland. Peatlands grow in height and spread across their surroundings by waterlogging woodlands. They are also one of the biggest terrestrial sinks of atmospheric carbon dioxide. Each year, around 20 grams of carbon are absorbed by every square metre of peatland. The researchers found that around half of Sweden’s surface could be covered by peat. In such a case, the carbon dioxide sink would increase by a factor of between six and ten compared with the current situation. The relationship between carbon dioxide and temperature is not linear. Instead, lower levels result in a greater degree of cooling than the degree of warming achieved by a corresponding increase. Using calculations for Swedish conditions, the researchers are also producing a rough estimate of the global carbon sink effect if all temperate peatlands were to grow in the same way. Professor Franzén and three other researchers have published their findings in the journal Mires and Peat. 1. Franzén, L.G., F. Lindberg, V. Viklander & A. Walther (2012) The potential peatland extent and carbon sink in Sweden, as related to the Peatland / Ice Age Hypothesis. This was the exact argment in the 1970s…. We have been saved! C02 is the dominant climate driver. Runaway warming is up next on your scheduled program. And if we don’t accept this premise, it invalidates the entire theory. Increased felling of woodlands and growing areas of agricultural land, combined with the early stages of industrialisation, resulted in increased emissions of carbon dioxide which probably slowed down, or even reversed, the cooling trend. Didn’t the IPCC say man had a discernible effect on global temperature after 1960? Hey, let’s say even 1920, someone is trying to deceive me. This is not a problem should it arise. The problem is global warming which could lead to mass migrations, hunger, drought and calamity. Ice ages are good, warm tropical temperatures kill vegetation and animals all across the tropics while the polar regions thrive with life. Anyone for an Antarctic safari? With the chnges am seeing with the jet stream and and weather patterns, there does seem to be a battle going on between climate warming and cooling at the moment. lt looks like that maybe the cooling is starting to win out. Mankind’s emissions of fossil carbon and the resulting increase in temperature could prove to be our salvation from the next ice age. We do not use the proper controls. You need to compare the temperature of the earth today, with that of an identical earth in which the CO2 levels did not increase. Don’t let them think we can change things on purpose. Or, we’ll never escape their clutches. Burns Bog is the largest domed peat bog in the world encompassing over 40 square kilometres of land. Human activity in the late 18th century was confined almost exclusively to Europe. Damn near no one lived in N. American or Latin America or Australia (given the size of the land masses) and Africa was still mostly an unexplored continent. The total, complete, absolute garbage that these “scientists” publish is a disgrace. 1. What caused the ice ages before humans even existed? 2. What caused the warming that ended the “pre-human existence” ice ages? 3. If item “2” above, was caused by a build-up of CO2, pray tell, where did the CO2 come from? 4. Has it not been shown that CO2 increases in RESPONSE TO TEMPERATURE INCREASES? 5. 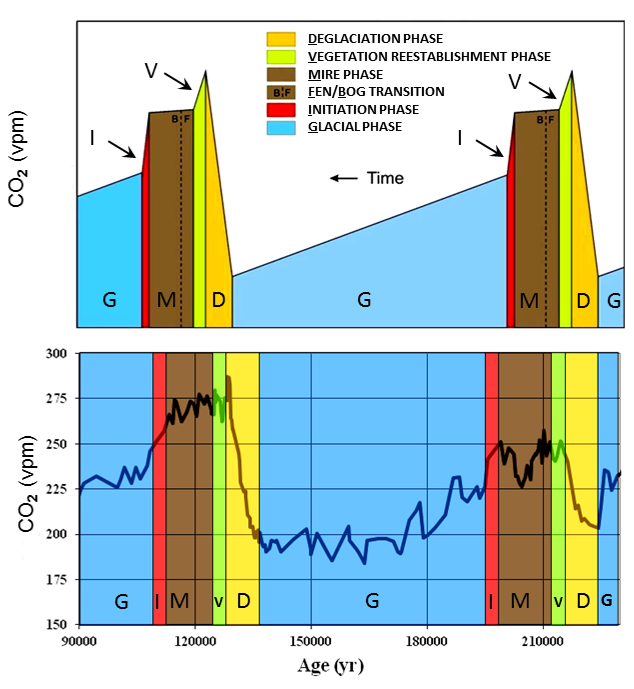 During the interglacials – and before humans walked this earth – presumably caused by CO2 buildup, what happened to all that CO2 that should have prevented a subsequent ice age? 6 Why didn’t the CO2 levels during interglacials just get larger and larger, causing ever more and more warming, until the planet just became an oven? 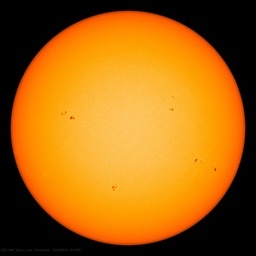 At a minimum all this CO2 should have never permitted another ice age. It’s always all one way. This time, “The researchers believe that the Little Ice Age of the 16th to 18th centuries may have been halted as a result of human activity. Increased felling of woodlands and growing areas of agricultural land, combined with the early stages of industrialisation, resulted in increased emissions of carbon dioxide which probably slowed down, or even reversed, the cooling trend.” and “Without the human impact, the inevitable progression towards an ice age would have continued“. Brilliant. That’s how just one of the “at least 30 periods of ice age, known as ice age pulses” came to an end. Hmmm. Now tell me about the other 29. How they started, and how they ended without human assistance/. What terrifies me is not that the alarmists are so desperate that they are telling bigger and bigger lies, but that as the MSM lets them get away with (or encourages them in) their lies, so they happily tell bigger and bigger ones. They aren’t losing, they’re winning. Haha. Not out here in the real world. The only people not noticing it are the ones fooled by adjustments, models, and propaganda. Odd that if it was so easy for peat bogs to drive down the CO2 levels in the atmosphere that they aren’t being considered as possible carbon sequestration projects? No No No No No No. The greenhouse effect of CO2 is far too weak to prevent an ice age. Idiots. CO2 at more than 10 times today’s level didn’t seem to help in the late Orodovian period. Sometimes, all I can do is just shake my head. The effect of condensing and non-condensing radiative gasses in our atmosphere is cooling and no amount of politics, pseudo science and spin will ever change that. Without radiative gasses, rising air masses heated by conductive contact with the surface would have no way of cooling at altitude. (Adiabatic cooling is irrelevant to convective circulation problems.) With gasses unable to cool by radiation at altitude, convective circulation in our atmosphere would slow and cease. Our atmosphere would slowly heat to the hottest point of conductive surface contact. That would not be the surface of the hottest desert, that would be exposed liquid magma. It matters not if the ground under your feet has a slightly lower average temperature if you are breathing the air from an oven. As I recall this idea goes back to the 70’s. Objections are the same as to AGW. Ironically, I just finished watching this wonderful recollection of history. Be aware that this video touches on climate change, coal, oil, CO2, SUV’s, glaciers etc. It may be horrifying to some, but it is fascinating to me…. As if anyone will fall for that two card trick. the mainstream explanation of GHG is totally flawed because the real physicals is virtually opposite of greenhouse effect, let alone CO2 have a significant involvment in temperature changes. Its a trace gas for crickey’s sake. Is it me or are the papers getting weirder and weirder? Oh for peat’s sake! (Sorry) Stretch much? I could have had summers off and been able to peddle this stuff? I missed the boat. Give these authors a break. Did you notice the name of the journal this appeared in “Mires and Peet”? These guys see that Climate change is where it’s happening and they just want to get in on the fun. I’ve decided to let my subscription to Mires and Peat lapse. Meanwhile, perhaps creating synthetic peatlands would assuage those concerned about reducing CO2 in the atmosphere. We could even trade peatland credits for those who prefer other their lawn. We therefore must believe that carbon dioxide will not slow down an ice age. Logically, that which initially causes the spreading of the peatlands should be the cause of the glaciations (in this paper); the subsequent lowering of CO2 levels and its effect on global temperatures are feedbacks, not the driver. 1. The total increase in the atmospheric content of CO2 following the large increase in CO2 emissions after 1945 amounted to only 0.008%. How much warming can you get from that (forget the nefarious ‘water vapor effect’–it hasn’t increased during the 1978-1998 warming). 2. If such large increases in CO2 emissions caused only 0.008% change in CO2 content of the atmosphere, how much could a small population cause? Precious little! 2. There have been 27 episodes of global warming and cooling, all of which occurred with no increase in CO2. What caused these warm periods? Certainly not CO2. 3. Almost all of the past 10,000 years have been warmer than present, long before any increase in CO2. 4. There is no physical evidence that CO2 causes warming. In fact, new papers show that even warming in historic time preceded small increases in CO2. This paper totally lack credibility in the face of these (and other) facts. And wouldn’t rotting vegetation under these peat bogs bubble up Methane – apparently the most DANGEROUS GHG, offsetting any CO2 sequestration? How much of the globe is covered by peat bogs anyway? What a farce. Exploiting (inventing) one globally insignificant metric about peat bogs and CO2 to explain the cause of ice ages for more funding. Hooray.. Chuck that man a “Go To Jail” card. I hate to admint I’m from Sweden. This paper don’t pass the laugh test. Does this mean I’m allowed to breathe out again? The effect of condensing and non-condensing radiative gasses in our atmosphere is cooling and no amount of politics, pseudo science and spin will ever change that. Without radiative gasses, rising air masses heated by conductive contact with the surface would have no way of cooling at altitude. (Adiabatic cooling is irrelevant to convective circulation problems.) With gasses unable to cool by radiation at altitude, convective circulation in our atmosphere would slow and cease. The only thing in there I agreed with! Yikes! Your bum would stick to the loo. This is a well worded (and funny as hell) response to the nonsense. Of course, now the fringe Earth First types will complain that natural ice age glaciation won’t be able to wipe the excess number of people inhabiting the planet. That said, if CO2 is doing so little now, it’ll be no match for the natural cooling processes. Aaaah … excuse me … who turned off the Quaternary Ice Age while I wasn’t looking? ice caps …whew! Don’t panic Professor, the next glaciation will come on time! I very much liked JA’s list of objections and questions, which to my way of thinking pulls the rug out from under the entire paper; not to mention pulling the rug out from under the entire CAGW hypothesis at the same time. And yes, if you take the position that CO2 is not a principal driver of global temperatures – and even a cursory glance at paleoclimatology confirms that fact – then, again, the paper is invalidated. Steve D’s lament that ideally, to test the CAGW hypothesis under perfect conditions we need an identical Earth minus the CO2 increase, is true enough. But geology shows us that our planet itself has conducted countless experiments with varying temperatures and varying CO2 concentrations for billions of years, and the results are there in the geological record for all to see. None of the experiments is perhaps quite as perfect as Steve’s idealised thought experiment but from the results it’s plainly obvious that carbon dioxide is only a minor player. Why any scientist worth his/her salt would entertain the possibility that human-produced CO2 could have any significant effect on the climate is something I just don’t understand. But I think I do understand the motives of some of the people out there peddling this nonsense – and it’s got nothing to do with science. This “research” is also another form of wet organic material. Thanks to our Irish cousins for saving us from an Ice Age. Sorry that the heat and light that your ancestors got from peat fires was non-existent but what the heh you now know that it was for the greater good – an AGW parable if ever i heard one, to be sure. If it were possible to instantly remove all radiative gasses from the atmosphere it would still take some time for convention to slow and stop, however it would eventually happen. Turbulent mixing at altitude and solar differential heating causing turbulent contact with areas of the earth’s surface that had radiately cooled at night would delay the eventual stagnation. However if the only way atmospheric gasses can cool is restricted to conductive contact with the earth’s surface, convection must slow and cease. – two 1m long EPS foam tubes 100mm diameter closed at both ends. – four water coils. Thin aluminium tubing wrapped in a spiral with both input and output tubes pointed in the same direction and sprayed matt black. – In “Tube 2” install both water coils inside the base of the tube 75mm apart. – Connect one of the hot tubes to the water coil in the base of tube 1 and the other to one of the coils in the base of tube 2. Install return lines from the two coils used to the hot water box. – switch on the water pumps and observe the temperature differential reading on the dual probe thermometer. Tube 1 is a crude representation of our atmosphere in which air is heated at the surface and displaces air that has cooled by radiation higher up. Tube 2 represents a theoretical non-radiative atmosphere in which air can only heat and cool through conductive contact with the surface. We need radiative gasses in our atmosphere to survive. Water vapour is the most important. The hydrological cycle represents a giant vapour / condensate heat pipe, lifting heat high into the atmosphere where much of it is radiated to space. This was the science in the 50’s, the reality has not changed but it has been obscured by the pseudo science of AGW. The effect of radiative gasses in our atmosphere is cooling. Adding more will not cause CAGW. BREAKING NEWS: Mars has what we expect. nothing, name some rocks! are you finished? From experiments in garden weed control one suspects that the thousands of years required by the “vegetation establishment phase” might just be a smidgeon overstated. I doubt it, with global cooling oceans will easily mop-up excess CO2, remember CO2 follows the temperature’s changes. Officers on the hunt, at night with torches, on different occasions…:-). scientists (excluding Willis … )? as are those few who do really look. out there. (Look Up) It neither knows nor cares about us: the Galaxy. Maybe we need to look up and look out. A few others have. I don’t buy it. In the end the Earth’s temperature is related to the level of incoming solar radiation and the warming of the planets surface. Since the specific heat capacity of water and rock is very much higher than that of the atmosphere, most of the heat energy is held in the sea and the land. Messing about with the atmosphere will make very little difference to the land or sea surface temperature, and hence to whether ice will form or not. Therefore, the orbital variations that cause the ice ages cannot possibly be counteracted by pumping lots of CO2 into the atmosphere. N. N. Taleb (Fooled by Randomness) teaches that the best forecasters/predicters have skin in the game. None have skin in the distant future game. Peatland may be a carbon sink but they also produce methane. If these gallant people in Sweden think that out 3-4% of the total annual CO2 budget will make a difference to an ice age then they do not live on the same planet as me. Great minds run in great circles. There are those amongst us who realise that CO2 is very good at converting themal energy into radiation, the only form in which enegy can leave the planet. Thus increasing CO2 levels increases radiative loss and decreases the Earth’s temperature. The effect is subject to the inverse logarithmic relationship and obvious negative feedbacks (e.g. reduced water vapour and cloud formation) so for this minor greenhouse gas the cooling effect is small wrt increases in CO2 levels. If we invoke the unwritten law of tipping points however it is theoretically possible that the forthcoming Gleisberg minimum around 2035 might indeed trigger the next major glaciation a little earlier than is suggested by the Earth’s collapsing magnetic field, otherwise we can probably wait until 2240 for mamoth hunting to become a recognised Olymic Event. In the meantime many congratulations to Briffa et al for getting honest and shame on you skeptics for not exploiting this major fissure in the collapsing ice field of warmism. the bad climate villains are the ones who save CO2-emissions. ..its getting clearer from year to year…. I’m surprised nobody here has mentioned Plows, Plagues, and Petroleum: How Humans Took Control of Climate by William F. Ruddiman. claims is a byproduct of our agricultural practices (not cow flatulence, or thawing permafrost feedback, but standing water for irrigation purposes producing “swamp gas”.) It’s an interesting take on paleoclimatology. The usual shallow nonsense based on religious co2 preconceptions. If they think that the LIA was ended by mankind’s then very puny co2 input to the atmosphere, they should support that hypothesis with some numbers and calculations from sediment / ice cores. They don’t because the numbers don’t add up. Their theory fails to explain how the LIA occurred and they make no attempt to control for the most likely cause of the LIA and compare that to the same factors influence on the end of the LIA and then see if there is still room for their tenuous hypothesis. The paper is just another part of the avalanche of shallow co2 genuflections to the co2 religion. co2 ended the LIA ?! A miracle gas indeed. I think not. A recent paper (Bruce Bryson on Tallbloke’s blog, a paper worthy of the increased exposure that WUWT can bring) that examined the consequences of the effects of a simultaneous release of all the co2 in all the worlds entire known reserves of oil and gas found that that would create a temperature spike of 3C which would initially drop quite quickly. The implication of this paper is that all the warming that co2 can do has basically been done and the most we can expect with an uncontrolled increase in co2 by mankind would be at best another half degree centigrade. This will not be enough to stop the up to ten degree centigrade drop that a full blown glaciation can deliver. Perhaps these guys have been drinking too much peat filtered Whisky. In infantry school you’re taught that every animal has its weakness. For humans, it’s the inclination not to look up. To do so takes training. You’d think that evolution amid leopards would have produced upward-looking hominid species, but I guess maybe our ground-hunting & -gathering ancestors slept in trees, so didn’t have to worry about predators from above, although eagles took their young during the day. At infantry school you learn other valuable survival skills such as always to walk beside the trail, not on it, never to enter via a door or window, but to make your own hole (when possible) & of course, as in Roger’s Rules of Ranging, never to come out the same way you went in. Mission planners however often criminally neglect that rule, leading to needless loss of life, including my friends in Afghanistan. So, if we accept this paper as true, explain to me again why everyone is eager to save the wetlands? It seems to me we should be draining them off just to be safe. Well, if bogs flooding woodlands absorbs CO2 and causes ice ages then it’s got to be the dang BEAVERS! Nature’s thermostat, the beaver. According to my theory, the increase in temperature out of the Little Ice Age was caused by the fur trade. $omebody $end me $ome money. I’ve been mentioning this effect off and on for about 3 years now. I call it the cooling effect of GHGs. Keep in mind it doesn’t negate the fact that increases in GHGs do have a warming effect by retaining surface radiation. However, that is balanced by this cooling effect on the atmosphere. I’ve often wondered why I’ve never seen a single climate scientist attempt to quantify this cooling effect. It has to be real based on the physics of radiation. It’s also interesting that water vapor condenses at low altitudes which reduces it’s ability to cool while CO2 has concentrations pretty consistent throughout the entire troposphere. This should mean CO2 is better at cooling the upper troposphere than H2O. No wonder there’s so much CO2 now, with the giant beavers of the Pleistocene gone extinct! If this SST map from Unisys is to be believed, there is no need to stop the Gulf Stream it’s going to be cold anyway. The SSTs around Florida are very cold (and it is cold here today in Florida too despite (or perhaps because of) clear skies. No way to know, since interglacials vary in duration, but my guess is there is at least one more Bond Cycle left in the current one, although we are well into its third phase. So far, we’ve had: 1) the deglaciation phase, with wild climate swings, ie the Dryases & the 8200 BP meltwater event, followed by 2) the Holocene Optimum down to around 5000 BP (very roughly) & its breakdown, such as the 4.2 kya event & Late Bronze Age collapse (such as the Old Kingdom of Egypt) then 3) the first of the late interglacial phase warm period spikes about 3300 BP (improperly called the Minoan, since that civilization fell c. 1500 BC). Subsequent spikes during the Roman & Medieval Warm Periods apparently peaked at lower global temperatures (depending on reconstruction, but IMO this observation is valid), also with lower trough temperatures in each succeeding, intervening Cold Period. Contrary to AGWist doctrine, the best available data suggest to me that the Modern Warm Period follows the downward trend, too, in which case the next cold spell should be worse than the LIA, but still a far cry from from conditions required for reglaciation of North America & Eurasia with ice sheets. Or maybe humans (or something) warmed the present WP up slightly, so that its peak global temperature equals the prior WP. In any case, people could burn all available fossil fuels over the next millennium without, IMHO, being able to forestall reglaciation by that means alone. I should note that warmer spells occur during CPs & cooler spells during WPs, just as counter-major trend cycles occur within a secular market trend (bear or bull). A prime example is the Sui-Tang warm cycle within the CP between the Roman & Medieval WPs. Some argue that there are no cycles or trends, just random-walking fluctuations due to statistically insignificant noise, but I disagree. Bond Cycles seem to exist during interglacials, just as the much more dramatic D-O cycles (& the North Atlantic iceberg armadas called Heinrich Events) indubitably do in glacials. So whether reglaciation lie 500, 1500 or 3000 years in the future, it’s coming & man-made carbon dioxide is unlikely going to stop it, IMHO. Dog-gone-it! Why mess up a perfectly good thesis by using a reversed time axis??? Florida seas are about 2C cooler than normal, since Sandy absorbed some of the heat, but temperature is still around 25-26C. This all makes sense to me, if Gaia is truly alive, our CO2 emmisions can be our way of telling her(sorry…he/she/it) that we are all alive and really need he/she/it not to start another ice age and wipe us all off the planet. So emit away boys, I keep trying to grow coconut palms in my back yard but its still too damn cold. While those of us living in northern areas wish for this to be true I seriously doubt doubling, or even tripling, current CO2 levels will slow much less stop the return of glaciation. It is very interesting to note that they are still clinging to the belief that CO2 is THE climate driver but now it might be a good thing. Interesting angle from a political perspective but nothing to back up the basic assumption of CO2 being the climate driver. Agree, as Swede, fully – it doesn’t pass the laugh test! +1! CO2 in the thousands of ppm have failed to prevent ice ages, so this tiny amount compared will have no measurable affect. Lets note that rising CO2 has never prevented the next ice age ever during the record. It is worse than you imagine. The original suggestion that CO2 might stave off the next glacial epoch was, IIRC, bruited by Arrhenius over a century ago, after he noted that CO2 in laboratory experiments absorbed LIR. That was considered a “good thing.” But, if you dig into the geological record, there are two major planetary climate states that are occasionally referred to as “ice house” and “hot house” states . There are at a minimum eight such major oscillations during the Phanerozoic (ca. 520,000,000 years) averaging about 65,000,000 million years each. Since we are currently in an “ice house” state, we might be coming up on a shift to a “hot house” state anyway, since the current phase was entered not long after the end of the Cretaceous. However, to make matters more interesting, while the Pliocene, like the Pleistocene, was a period of alternating glacial and interglacial climate states within a planetary “ice house” climate regime, it was considerably warmer than the present. The climate oscillations were shorter and less profound, see this. That shift to larger, longer oscillations with a lower mean temperature could be taken to mean that the planetary climate is about to “chose” a new stable state. Like taking a coin, setting on edge and spinning it, the early period is marked by fast changes (rapid spinning around a near vertical axis). As the coin slows and begins to wobble strongly, the new rest face is already chosen after the spin axis precesses away from the vertical. The spinning slows, the axial wobble increases, but won’t pass the upright state to the opposite face again. The data from the Pliocene and Pleistocene seem to point to a new cold state as the preferred rest point. This is what comes of confusing tree rings that are less than 2,000 years old with real paleoclimatogical data. And we know this because we have closely examined how much of the surface of Mars for how long? You forgot to mention that that Michael Burke video about the Ice Age and steam engine is fourt years old. Not too bad for the time, and a good example of what the BBC could do before it was infected by mindless liberals and environmentalists. Global warming, BAD. Cooling and Ice Age, GOOD. One might view three fingers face-on and say these represent the pre-industrial 280 PPM CO2 concentration and let four fingers represent the current CO2 concentration near 396 PPM. Then look at the difference between these fingers viewed edge-on as in a hand salute. As each cohort of CO2 has the same narrow 15 micron blocking band, that edge-on view of the fingers represents the difference between 280 and 396 PPM CO2 concentration in the atmosphere when blocking radiation emitted from the earth. This would suggest that it might take a near poisonous concentration of CO2 in the atmosphere to avert an ice age due to the logarithmic temperature effect of CO2. What a moronic assertion about carbon! It seems all too many people who call themselves scientists are so full of baloney they could turn Mars into a methane farm; people need to understand some basic physics before they mouth off on climate. Atmospheric CO2 was at a concentration of 4000 ppm during the climax of the last ice age, it’s at about 350 ppm now! The proof is in now and we know that CO2 lags warming, period. It is an effect, not a cause. Paging Mr. Moss, Mr. Pete Moss…. upon climate, weather he likes it or not…. I like your idea of how to warm the arctic by removing a chunk of the Faroe Bank. It would be harder than digging the Panama Canal, but if it spared us an ice age, humanity could do it. There is something refreshing about imagining a project where something is actually accomplished. True, it is only imagining, and no dirt is actually moved. However it is very different from climate models, and the economy of carbon credits, where intellectuals fool about with numbers and no true sweat and work is involved……and in fact businesses are bankrupted and less work occurs. I wonder if some people are unconsciously allergic to work. It might explain why the entire Global Warming scam involves stopping so much constructive activity. While most peat bogs are at high latitudes, the most productive (the ones that capture the most CO2) are in middle and tropical latitudes. Middle latitude bogs have been drained for centuries, and in recent decades there have been large scale draining of tropical peat bogs, ironically much of the drained bogs are used to produce palm oil for biofuels. I wonder how much this has contributed to CO2 rises. Indeed, I agree with your assessment. Ice ages onset may be rapid in geological terms, but still takes hundreds of years with plenty of warning. By removing 2m height/annum job done in 100 years. There is an advantage in a slow removal, it would be matched by gradual cooling, so net result would be hardly noticeable in the temperature change. Problem is, our burn rate is peaking now. Then what? As I understand it, CO2 absorbs infrared, holds onto it briefly, and then re-emits it. Spherical geometry being what it is, it’s about 50% likely that an intercepted infrared ray from the ground will be re-emitted back down (or down-ish), thus “trapping” it instead of letting it escape to space, thus “warming” or at least preventing cooling. Yes? But isn’t that exact same CO2 equally likely to intercept an infrared ray coming in from the Sun and re-emitting it back out into space before it ever has a chance to reach and warm the ground, thus “cooling” or at least preventing warming? So, no matter how much CO2 you have in the atmosphere and no matter how fast it builds up, it’s going to block just as much incoming infrared from getting in as it blocks outbound infrared from getting out, for a net infrared change of, well, zero? It’s the exact same atmosphere, the same molecules, whether approached from above or below. Unless there’s some groundward directionality to the re-emission of the infrared, I can’t see how GHG-driven warming (or cooling) could occur. Only if the Sun brightened in the visible spectrum, so that the visible light bypassed the GHGs on the way in, then hit the ground and “transposed” down to infrared. mellryn – Yes you are missing something. Only a small part of the incoming radiation is IR, but virtually all of the outgoing radiation is IR. Thus the incoming radiation gets in virtually unscathed but the outgoing radiation cops it from atmospheric CO2 The main argument is about the IPCC’s mythical “positive feedbacks” without which there would be no “C” in CAGW. A secondary argument is about whether the CO2 has reached saturation and therefore doesn’t absorb any more as concentrations increase. Hi, Mike, and thank you for your reply. And I’m not trying to be difficult (though I may be succeeding). Only, you write “Only a small part” — well, OK, wikipedia is not the last word in human knowledge, but it says, “Sunlight’s composition at ground level, per square meter, with the sun at the zenith, is about 527 watts of infrared radiation, 445 watts of visible light, and 32 watts of ultraviolet radiation” and “Sunlight in space at the top of Earth’s atmosphere at a power of 1366 watts/m2 is composed (by total energy) of about 50% infrared light, 40% visible light, and 10% ultraviolet light”. I’d gone there first, in fact, ‘cos I didn’t even know IF the Sun shone in the infrared (I thought it should, but I couldn’t say I knew for sure). “Half” doesn’t seem like such a small part. ? Mellryn – I confess that I thought the proportion was much lower. I usually check everything but missed this. So – we have a figure for incoming total and incoming IR. We know that in a stable situation, outgoing total must basically equal incoming total. But this outgoing total must be virtually all IR (and I haven’t checked this but hopefully I’ve got it right this time). That still seems to give man-made CO2 plenty of net outgoing IR to work on. Hi, Mike. I can’t find the outgoing proportion anywhere. Earth is obviously visible, and obviously blue, so at least some outgoing is in the visible range. I’m hard-pressed to imagine the Earth absolutely blazing in infrared — we’re not that hot — but I also don’t know what, say, an ordinary energy-inefficient house looks like in infrared compared to visible light. And my lack of imagination is no excuse for a real argument. 🙂 But I’m not clear that it matters. The CO2, from whatever cause, might have a lot to work on but — well, it’s like this: dirt is of course opaque to visible light, but if the dirt is very fine and very dispersed in a transparent medium like air or water, there is still some light that doesn’t get blocked. So there’s a stuff that is visibly (i.e., something I can imagine … ) opaque and yet under conditions of being dispersed, its opacity, its light-stopping power, is accordingly reduced. There’s obviously not enough CO2 in the atmosphere to block ALL the incoming infrared, so even if there is more infrared outbound than inbound, how could it block more outbound than inbound? If we shone a light downward from the surface of a lake, and a light of twice the lumens upward from a 10-foot depth, how much light would a light sensor at the surface pick up relative to the light sensor at the depth?